Over the next 3 years viewership has grown significantly and I've been collecting feedback from fans of the website. Now as of late 2010 we have reached another milestone for ISSTracker.com, version 2.0. With the onset of v2.0 of ISSTracker we have a larger map, adjustable flightpath durations, Metric and English Units of Measure, and now a visibility ring. The only feature to be lost in v2.0 is the daylight map, which is due to a lack of support of Daylight maps using the latest version of Google Maps. In time this feature may return. Also with v2.0 of the website you'll notice the site is more then a single page website and there is now the Extras page. The Extras page is going to be where new features can be found that are are not ready for the Home page. 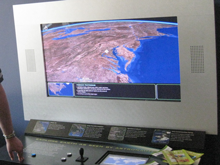 2008: Windows on Earth was installed into various museums accross the country. 2008: A window-side aide version of the exhibits software was created to be used up in the International Space Station to assist astronauts, such as Richard Garriott in identifying targeted locations that they want to photograph while aboard the space station. 2010: A ground based utility was created that uses the timestamp from photos taken aboard the space station and identifies the position of the space station at that given time.